Internal link building is the most powerful SEO tactic you are not using. It’s a tactic used by most well-known websites (i.e. those already ranking in the top 10) for one simple reason: it has the power to boost rankings like crazy. I am going to show you how one site used internal linking to jump from position #29 to #4 in a matter of weeks. And another that went from position #33 to #5. It’s also extremely quick/easy to implement and carries (almost) zero risk of Google penalties. In fact, it can be implemented pretty much overnight. In this post, I’ll be showing you everything you need to know about internal link building. Basically, an internal link will take you to a web page or resource on the same domain, whereas an external link will take you to a resource on a different domain. They help Google understand your website and can help direct traffic to important pages. Link #1 is an internal link (i.e. it links to another web page on my domain) which takes you to my ultimate guide to Scrapebox (btw, this currently ranks #2 for “scrapebox”, so you can already start to see the power of internal linking!). However, link #2 is an external link (i.e. it links to a page on a different domain) as it takes you Patrick Coombe’s website. Google’s discovers new websites/pages in a number of ways, although most pages are almost certainly discovered via web crawling/spidering. Right now, Google has 554 pages from my blog in their index (hint: you can check the indexation status of your website with a site: search in Google). I know my blog pretty well (obviously), so I know that 554 pages = pretty much all the pages on my blog. Great, so that’s Google’s work done, right!? Google knows websites change all the time. For example, you may periodically change the content on your “about us” page, or write a brand new blog post every few days. They have to constantly re-crawl websites/web pages to look for new content. This is where internal links come in. Google relies on internal links to discover new content, this works because whenever you add a new page/post to your website it’ll almost always be linked-to from somewhere on your website. Because Google has already indexed my main blog page (and category pages), their crawler will follow that internal link to discover my latest blog post during their next re-crawl. Like I said, most content management systems (e.g. WordPress) add internal links to new pages/posts automatically, but these aren’t always in the best location for SEO purposes. It’s rumoured that the number of internal links pointing to a web page is one of Google’s 200+ ranking factors. I’m talking about jumping from position #29 to #4. And position #33 to #5. All using nothing but smart internal linking. But, why would this be a ranking factor? Well, Google uses the number of internal links to a page to figure out how important that page may be. For example, I link to my blog income reports from within my main navigation bar (which is present on every page of my website) — this tells Google that I deem this content to be of high importance. And if I think this page is important, chances are that other people will, too. Another important aspect of internal links is the anchor text used within the link(s). This helps Google to understand what that particular web page is about. For example, in one of my income reports, I link to my SEMRush review with the anchor text “epic SEMRush review”. In Google’s eyes, this helps reinforce what that page is about (i.e. a review of SEMRush) and helps them feel more confident about ranking it for SEMRush-related terms. In simple terms: the anchor text you use for internal links is almost certain a ranking factor. And if you’re worried about being penalised by Google’s Penguin (4.0) algorithm for manipulating anchor text like this, don’t worry; Penguin is much more lenient when it comes to internal links. Internal links provide a navigational aid for real-life visitors to your website. The links in your navigation menu provide perhaps the most obvious example of this — they funnel visitors to the most important pages on your website. But this is also true for internal links within your content. 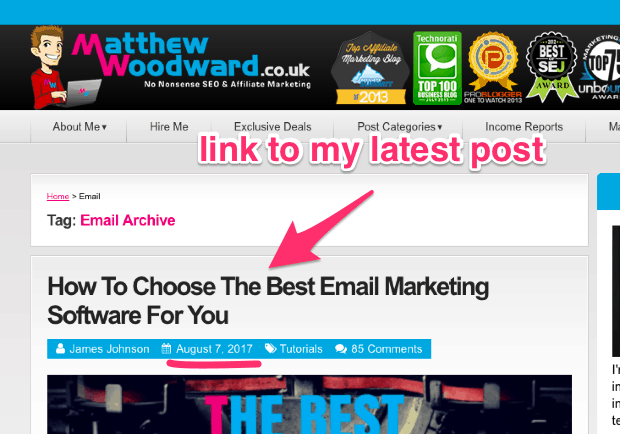 For example, I funnel visitors to my email marketing strategy using an internal link in this post. But why do I do this? Because it makes me more money. Not only does my email marketing post provide a ton of value for my visitors (or, at least I hope it does! ), it also contains affiliate links. It’s also worth noting that the use of strategically placed internal links will help reduce bounce rate; this can have some SEO benefit and indirectly increase revenue. Because Google probably uses a type of bounce rate as a ranking factor if people click back to the SERPs after visiting your site. So while bounce rate is not a direct ranking metric (Google can’t know that for all traffic sources) it is an indicator towards people returning to the search results rather than engaging with your content. A lower bounce rate may mean you rank higher and therefore lead to more organic traffic. More traffic usually = more money. It’s time to build some strategic, rank boosting, revenue-increasing internal links. My quick ‘n’ dirty method. The manual method (hint: this is better than the quick ‘n’ dirty method, but is more time-consuming). BONUS: The power process (trying to rank a certain page? — you need this). Let’s go through each one step-by-step. When it comes to SEO, time = money. This is because the longer one task takes, the less time you have to spend on other important tasks (this is known as opportunity cost). My 3-step quick ‘n’ dirty process can be implemented super-quickly, yet it still leads to incredible results. Note: This method only works for WordPress-based websites. Use the SEO Auto Linker plugin to add strategically-placed internal links in seconds. Important: I’ve created a Google Sheet to make this process insanely straightforward. I recommend making a copy of it before you begin. Some of you will already have a list of URLs mapped to primary keywords. If so, fantastic — paste them into the first tab of your Google Sheet (this is the one titled: “#1 — URLs / Keywords”) and jump straight to step #2. If not, no worries, you can use either SEMRush (click here for a free 14-day trial) or URL Profiler (again, 14-day free trial available here) to export a list of keywords your web pages already rank for. But first, you need to gather a list of URLs from your website. If you have a sitemap (which you should), you can simply copy/paste the list of URLs from the sitemap into the sheet. This will return a list of all the pages on your website. You can then use this free Chrome bookmarklet to scrape all 100 results from the SERPs. Paste these into the URLs column in the Google Sheet. Next, use the SEMRush or URL Profiler trials to extract the keywords each of these URLs currently rank for. Go to the URL report (under Organic Research) in SEMRush. Scroll down and you should see a list of organic search keywords for that page. Open the .csv in Excel, the copy/paste the list of keywords into this free tool — this will convert the list of keywords (which are exported into a single column) into a comma-separated list. Copy the comma-separated list (on the right) into the “primary keywords” column in your Google Sheet. Rinse and repeat for the rest of the URLs on your list. URL Profiler connects to Google Search Console to extract the keywords your website already ranks for. Copy/paste your list of URLs into URL Profiler, then tick the “search analytics” checkbox. Important: You MUST connect URL Profiler to Google Search Console for this to work. This can be done under Accounts on the menu bar. URL Profiler should spit out a .csv showing all URLs and their corresponding keywords. Annoyingly, these keywords are divided into multiple columns, so you’ll need to use this free tool to convert this into a comma-separated list. Copy all the keywords from the .csv for a particular URL. Paste them into this tool. Under Step 3: Choose output options, check the comma option under the options for Output Field Separator. Click Convert CSV to Delimited. Copy/paste the comma-separated list of keywords into the Primary Keywords column in your Google Sheet. “LSI keywords” is really just a technical term form “related keywords”. For example, if we take the keyword “product launch formula”, an LSI keyword could be “product launches” or “launching a product”. Because you’ve already got a list of keywords for each of your URLs, finding LSI keywords should be a breeze. Start by brainstorming related keywords. Add them to your spreadsheet. Copy one of the keywords from your Google Sheet and paste it into Google. Scroll to the bottom of the results page and you should see a list of related searches. Rinse and repeat for the rest of the keywords (and for all the URLs) on your list. Go to LSIGraph.com and paste in a keyword from your spreadsheet. It should then kick back a bunch of LSI keywords. Add any relevant ones to the LSI Keywords column in your spreadsheet. Good news: most of the hard work is done. SEO Auto Linker will handle pretty much everything from here. But, first things first, you need to install the plugin. Once installed, go to the plugin page in your WP dashboard and click Add New Link. Next, go back to your Google Sheet and select the tab labeled “#2 – For WP”. This sheet pulls all of the keywords you entered into a neat list that you can then paste into WordPress. All you have to do is select a URL from the dropdown. SEO Auto Linker will comb through your website looking for occurrences of those keywords in other posts/pages. If it finds any, it’ll automagically add an anchored link to your specific blog post. Note: I usually set the Links per Page option to 1, as I don’t want a ton of links on every page — that just looks spammy. SEO Auto Linker works well — the only issue is that you don’t have full control over exactly where these links are placed, as the plugin decides this for you. In my opinion, it’s much better to do this manually. That way, you can control exactly where the internal links are placed and ensure they make sense and attract clicks. Create a list of URLs and target keywords. Use Google to find relevant pages/posts on which to add internal links. Rinse and repeat whenever you publish new content. 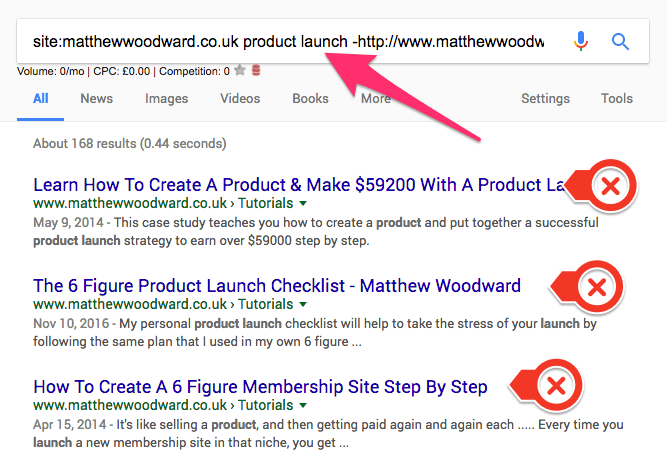 I’m not going to go over gathering URLs and primary keywords again — simply use the methods laid out earlier in the post to do this. Next, you can use the site: search + target keyword command in Google to find all other pages (from your domain) that Google thinks are relevant to a particular topic. I’m well-aware that performing this search correctly over and over again can be a bit of a hassle, so I’ve built this into the Google Sheet to make things super straightforward. Go to the 2nd tab of the sheet named “#2 – For Google”, select the URL you’re building internal links to from the dropdown, then hit the “Click here” button. This will take you straight to the Google search — no hassle! Let’s assume I was looking to build some internal links to my 6-figure product launch formula. I would select that URL in the spreadsheet (see above), open the Google search results, then pluck out any pages that would make sense to add internal links from. So, it’s now simply a case of reading through the post and looking for appropriate places to internally link. Next, I simply login to my WP dashboard and add a link in that location. Note: I only recommend adding 1 link per page, so when you’re done, head back to the SERPs and look for more internal linking opportunities. Rinse and repeat this process for each page on your website. Important tip: Do this process every time you publish a new blog post or web page on your website. Not only will this lead to Google indexing the page much quicker, it’ll also give it a much needed ranking boost. Is there a particular page you want to rank above all others, yet it’s nowhere to be seen in the SERPs? If so, you need my power process. Find the most powerful pages on your website using Ahrefs (free 14-day free trial available here). Add internal links from these pages to your target web page. Let’s say I wanted to boost rankings for my SERPed Ninja SEO Tools tutorial. I would first need to find relevant, powerful pages on my website from which to add internal links from. Ahrefs can help with this. Go to Ahrefs Site Explorer and enter your domain (register for your 14-day free trial here). Choose the “Best By Links” report from the “Pages” section on the left-hand menu. This will show you a list of the most powerful pages on your website, ordered by # of referring domains (i.e. backlinks). In general, more backlinks = more power. Look through this list and make a note of any pages that you could potentially add an internal link from. Make sure they’re relevant! Right away, my comparison of backlink checkers stands out. With 110 referring domains, it’s certainly powerful. And, because SERPed actually pulls in data from some of the backlink checkers I mention on that page, this would be the perfect page from which to mention (and add a link to) my SERPed guide. I think the conclusion would be the perfect place to add the link. Why? Because I mention Majestic (i.e. one of the tools SERPed pulls data from). I also talk about positives and negatives for each of the backlink checkers, so perhaps I could mention that SERPed kills two birds with one stone by pulling in data from more than one of these tools? Adding a relevant internal link like this would give this page a huge boost. But there’s no need to stop there; keep working your way down the list of top pages on Ahrefs — there may be other pages you can add an internal link from. This will give the page even more of a boost! Important: Just make sure to vary the anchor text between pages! Internal linking is crazily powerful — don’t neglect it! Plus, unlike regular ol’ link building (from external websites), internal links are entirely under your full control. I strongly recommend you give this a shot right now. What Is On Page SEO & Why Do I Need It? Wow – amazing content. Internal links are a bit like the forgotten sibling to link building. I always create internal links as I create content but some the techniques here are awesome. Many thanks for such a practical article. Thank’s a lot for this killer post! Couldn’t think about outer world till it’s end…. I would love to comeback with a few question later…. That is interesting. I will start taking internal linking more seriously. Thanks for the step-by-step guide on each of the strategies by the way. Internal Linking is one of the most underrated and a highly useful link building thing to rank websites in today’s modern era of google rankings. Just like you say the strongest backlink that you can get is a pbn because there you have full control over the anchor text, the content etc. Same is the case with internal links. Here you can write unlimited related topically relevant posts and adjust anchor text that will increase your rankings. Great strategies and i have found your post very informative! Thanks for this! . Keep up the great work! The informativeness of this post is second to none. Thank you matthew. Hey, came here from one of your facebook sponsored links. It’s really an insightful article. I was doing good Internal link building. BUt, I got more knowledge here and will apply to all my upcoming posts. Thank you for sharing! This is detailed explained , I`m already doing this for my website not quite same but similar and I can confirm that this is working really nice. Excellent . So far I ignored the potential of Internal Links but now I realized their power. They have tremendous potential as an SEO tool. Thank you for sharing such a wonderful article. The best I red about Internal Linking. Detailed information. Good luck dude! Useful article, I will apply this knowledge in my website soon. But I wonder which method is more effective? Many internal links to one post or few external links to one post. Ever since i started to look for steps to increase my Google ranking through Link building, I have never come across such an important post. Keep doing what you know to do best Matthew. Great post! I read that SEO Auto Linker plugin hasn’t been updated in two years and has been causing issues. Is there any alternatives that you’re aware of? useful information about the link building strategy….. This is really a great tutorial matt. I also want to ask if it is possible to use another software for LSI and the one i can use easily? Nice link building tips Matthew. i will implement your strategies on my site. looking forward to more SEO and link building tips. Ama start implementing internal links on my blog. Any suggestions? Because this SEO Auto Linker plugin seems not to be supported anymore. Only just come across your site, and good info. Just wished this plugin was in date. Not the most powerful, but definitely powerful! Internal linking has helped me give my readers easy resource for further reading. It will give you few more traffic and less bounce rate. That’s weird, what about SEMRush? I get some new tricks from this post,I always apply internal linking but not the way you do it .Its awesome. Great article sir.. I think its time for me to focus more on my internal link than external link to other domain. Since i am new to this, i will fully follow your guide here to get better understanding how internal link work. No problem let us know how you get on! am i the first one to comment here? always powerful stuff. love the wp plugin recommendation to change keyword into internal link. one question though, when plugin deactivate, does the internal link stay or come back to keyword? guess i’ll have to find out..
thank you so much for this article! It’s so detailed and easy to understand. Really appreciate it! So, I decided to build a quick tool that would just go over all your sitemaps (the parent + children) and print out all your links. Hey…! Very nice useful Information.I have learnt new tricks by this article. WOW! I get new trick. WOW, Great and useful content. What a Great Blog it is! Internal link building is very helpful for getting more traffic to websites as well as ranking a website or blog in the Google. Thanks for sharing such a good techniques of building backlinks. Thanks for the actionable tips. I was not familiar with the tool you mentioned, SEO Auto Linker. Will definitely check it out. I’ve been using internal linking but need to be more strategic about it. Thanks for the article. I came to know some new tricks which I’ll implement on my website. Looking forward to more SEO and link building tips. It is nice to learn more about internal linking. We often forget the many places that we can link to. Internal links help but not so much as links from external sources. They are often more powerful. No problem, very good point. If you implement the right strategies your site will be unstoppable! This is great article post..
be most valuable work and link will be save . No worries, hope it was useful. Wow, it was so informative, you teach this in easy way with case studies. Thanks Matthew sir! No probs Deepak. I love a good case study! Link building is one major aspect of search engine optimization that you should know about and is extremely beneficial for your website. In the world of search engine optimisation backlinking is one of the most used words. The basic premise of a backlink is when one page links to another page it’s as simple as that! Since Google introduced the Penguin algorithm, much has changed concerning backlinks. Before the Penguin roll out even low-quality links helped in ranking a site. The quality of your backlinks is very important and the links should be contextual. Your goal should be getting links from authoritative and relevant sites. It’s also important for you to create backlinks to your site as it improves organic ranking, allows faster indexing of your site, and referral traffic. Quality not quantity is the name of the game. One important fact that you need to keep in mind about backlinks for search engine optimisation is that it is not the number of backlinks, which matters, but rather the quality of backlinks. Thanks very much Tom! Great thoughts. Wow, i learnt something new and exciting through your article on Link Building Process, Matthew! Internal links are hidden treasures. I can’t wait to implement these strategies. Looking forward to more tactics, keep up the good work. Thanks very much Jenny! Will do. Gees buddy, I have to be honest with you. I took up your course going back a while ago and after I implemented those directions for my own site and noticed the increase in rankings, I put it straight to my client sites and they all went up. I even implemented the internal linking that you suggested in your training and improved rankings within days. This is just even more positive content that I’m going to apply because there are a couple things that were missing from my original adjustments that I picked up here. I do use Auto linker on my own site and client sites but after having picked up more info here again, I’m going to do even more again to boost rankings. I’m a new blogger, needed this knowledge to grow my blogging views. Wow! First time i find an article that analyse every aspect of internal linking! thanks a lot!